The sport orthotic is the base for all of US Orthotic Center athletic models. It features a full custom arch with a deep heel cup and an extra 1/8” bottom layer. The running version incorporates runners wedge to help prevent the foot from pronating. The tennis model features a bottom layer or cushioned layer of poron for increased shock absorption. The NBA basketball has a layer of poron hidden under the top layer to aid in shock absorption, adding power to vertical leap. The golfer has a moderate heel cup with a layer of performance EVA that resists collapsing while adding power to your swing. The cycle orthotic has extra forefoot control to add power to your pedal cadence. The dress-sport orthothic model is can be used in dress shoes that have a removable insole, inside of a sneaker, or golf shoes. This model has a lower heel cup and a slimmer profile than the sport model with a 1/16” bottom layer. The dress orthotic model is is a dress/casual insole for shoes that have a thin removable insole. This model has a lower profile than the dress-sport. The fashion orthotic can be used in women’s or men’s dress shoe. They can be used in flats and up to women’s 4” heels. This has the lowest profile of all the models. Some doctors refer to this model as a whale or cobra tail orthotic. ALL MODELS CAN BE MODIFIED WITH CORRECTIONS AND ADDITIONAL TOP OR BOTTOM CUSHIONED LAYERS. 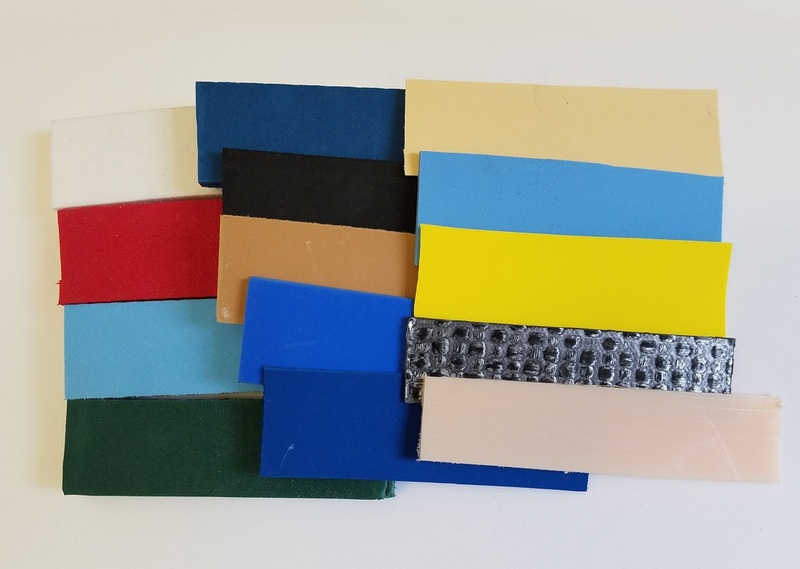 The different layers (differentiated by color) of materials are added to the bottom of the orthotic for a specific effect. 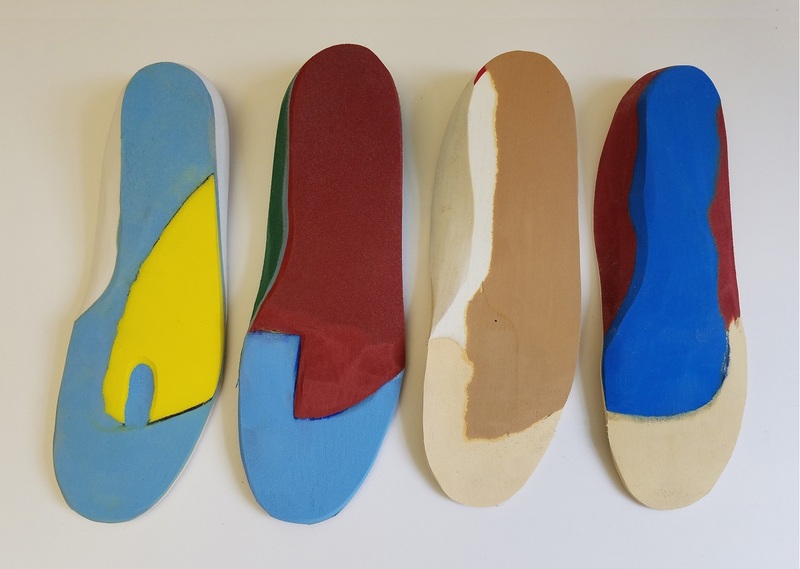 Here is a description of each orthotic correction from left to right. 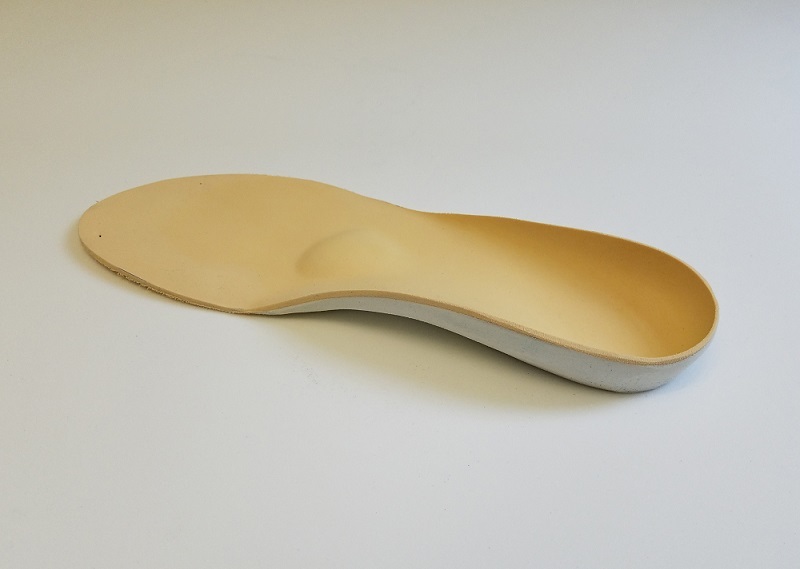 The first orthotic has a yellow wedge for forefoot supination and a well/drop to relieve pressure from a painful metatarsal head. This model shows a drop on the 3rd metatarsal, but multiple metatarsals can be dropped. For golfers or cyclists, we often incorporate this type of wedge without the drop so the knee tracks to the outside. The second orthotic is for Sesamoiditis. The brick-red layer has a cutout for the 1st toe that off-loads the painful area. Under the 1st metatarsal cutout is a layer of poron (light blue material). Poron is a fat pad substitute to cushion painful areas of the foot. Some doctors use this correction to relieve painful bunions. The third orthotic is for Cavus foot (high arch) correction. The tan wedge is used for supinated feet (feet that roll out) commonly found with high arch feet. The post is thick on the outside and tapers to a thin edge towards the arch. This model rolls the foot in. It can relieve ankle pain, peroneal tendonitis and inside knee pain. The fourth orthotic is used to treat Posterior Tendonitis. The blue wedge on this insole is called “posting.” It is a modification used for a pronated foot (a foot that rolls in or has a collapsed arch). The “posting” is thick on the inside and tapers to a thin edge on the outside of the foot to prevent the foot from rolling in. This correction is also used as a treatment for Posterior and Tibial Tendinitis, knee pain and hip pain. It also can relieve symptoms of scoliosis. Note: Multiple types of corrections can be combined on an orthotic. Orthotic colors may vary. The UCBL, which stands for University of California at Berkley, offers maximum stabilization and control. Used for extremely pronated (rolled-in foot), unstable or arthritic foot/ankle. It features an extreme deep heel cup, high medial and lateral flanges for the ultimate support. The Basketball orthotic model is the same model and color that the US Orthothic Center makes for the Brooklyn Nets. It features a hidden layer of shock absorbing poron sandwiched into the orthotic. It offers outstanding rebound cushioning for quick stop-and-go and jump maneuvers. The rockered carbon graphite plate can be used under any full length model. The plate is ultra thin and is used to relieve Hallux rigidus (stiff 1st toe), plantar plate tears and arthritic feet. 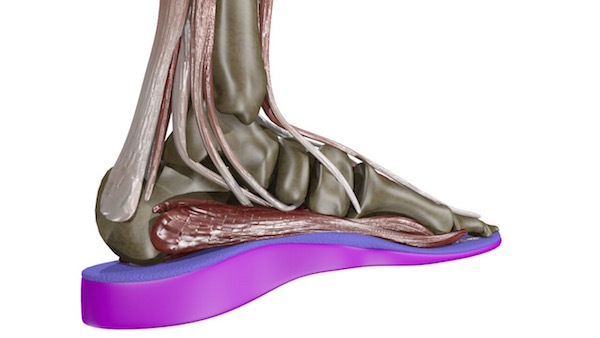 The plate prevents the toe(s) from bending, while stabilizing the arthritic midfoot and ankle. 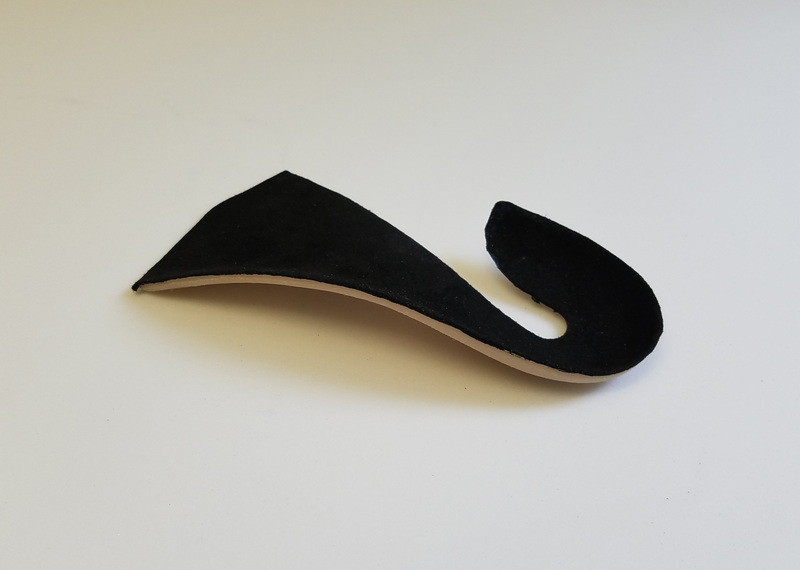 Most of our orthotics are made from EVA, a moldable rubber. EVA can be as soft as a sponge or as hard as a car tire. Our EVA thickness ranges from 1/16th” to 1/2” thick in gradients of 1/16th of an inch. The EVA can be glued and stacked to make heel lifts for short legs up to 6 inches. We also use poron material in 1/2", 1/4", 1/8" and 1/16” sizes. Poron is a cushioned shock absorbing material that is used as a bottom underlayment. Additionally, we stock rigid to flexible plastics including carbon graphite. 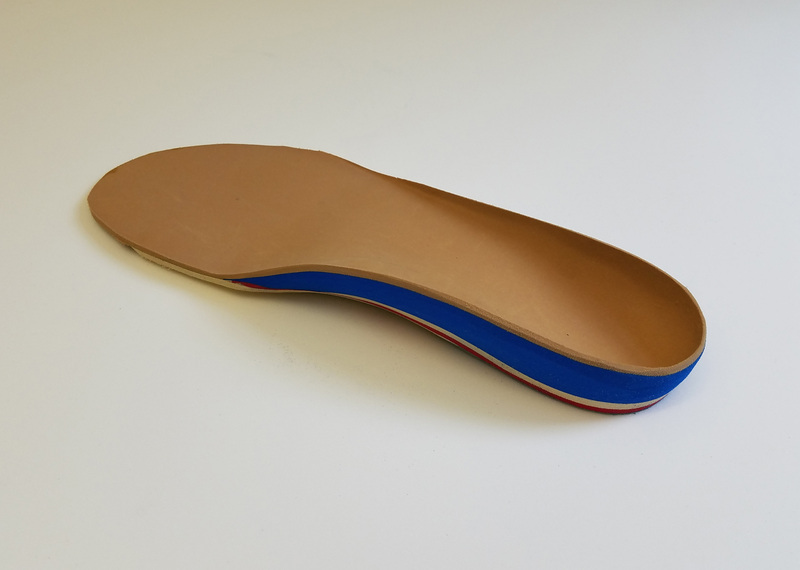 At the US Orthotic Center we custom design all of the orthotics according to your activity level, height and weight, combining different materials for the desired effect. The US Orthotic Center also makes insoles for children. The models are the same as adults, but sized according to the child’s foot. Oftentimes, the fruit does not fall far from the tree and children can inherit the same foot problems as their parents. If addressed early, orthotic support can help prevent the problem from exacerbating as the child grows into adulthood.